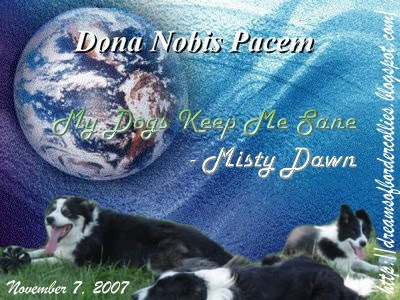 Misty's Musings: It's SOOOOO Beautiful! Oh my gosh, oh my gosh, oh my gosh!!! Look... just LOOK at what the marvelous, talented, sweet, considerate, thoughtful Sanni made for me!!! It is so beautiful that I literally teared up when I saw it - it honestly couldn't be more perfect! Gosh, can you tell that I really love it??? Isn't that one of the coolest and most beautiful things you have ever seen??? My jaws hurt from smiling so big, and I've got tears in my eyes again. I LOVE it! Thank you Sanni!!! Thank you SO much! That is a beautiful Peace Globe, I love the way Sanni has the dogs on it! That is very well done. I wish I knew how to mess around with graphics but I never seem to find the time. Thanks for the offer of help Misty, I always appreciate input I don't have your email though and I can't find it on your blog. So feel free to email me, my address is at the top right of my blog. I love it!!! I think I might be completely out of the loop, but what does the November 7th date mean? That is so COOL! I live in a shoe box so I don't now what Nov 7 is either. Tell me, tell me, tell me. What a lovely Peace Globe! Sanni really did an excellent job on that for you and I can see why you got all teary and mushy - it's beautiful!